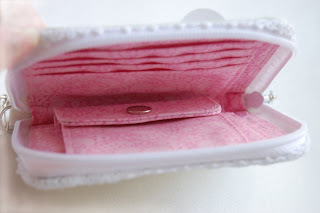 Last year, while I was going through my collection, I stumbled upon this Little Twin Stars wallet, which I bought off e-bay about a few years ago. Below shows that it comes with a small chain, which brings a nice touch to this sanrio piece. Sorry, LTS addicts, but this piece is not for sale. I was tempted to sell it once or twice, but I can't let it go. 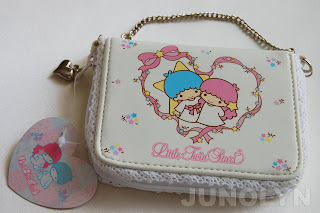 The frills on the wallet plus the heart charm was what made me decide to keep this cute LTS item. Isn't this just precious? This pink inside is so beautiful! 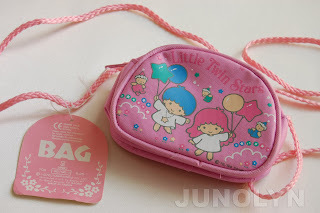 Another great find for me that I just got last year is this pretty Little Twin Stars *balloon* small coin bag. ^ It was thanks to a fellow sanrio collector that I was able to add this to my Little Twin Stars collection. This *balloon* design series is my one my ultimate favorite series. There's just something about those star shape and round shaped balloons that make me so fascinated. Now next LTS vintage piece shown below is an absolute treasure. 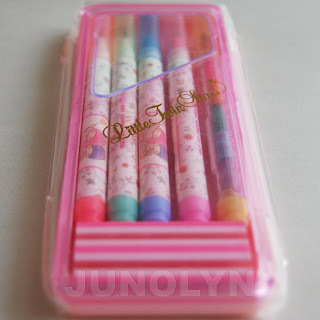 ^ As a Sanrio pen/pencil collector, this item set is an absolute "must have" in your collection. (Again not for sale, just for show) It has a pop up pencil, marker, pen, and more combined in this cute school set.